THE CENTENNIAL YEAR The Sayre Historical Society began as the History Committee of the Sayre Centennial and immediately became a separate entity. At the time, the mission was to publish a history of Sayre, to create a permanent historical society with a regular publication and to design a time capsule and plan for its placement within the community. All this was accomplished by Sayre's Centennial year - 1991. COMMEMORATING A CENTURY OF HISTORY A Century of Memories, the 128-page hard-cover book of 24 chapters with text and photographs of Sayre, was published. It was a success, selling out all copies. A monument recognizing the Lehigh Valley Railroad was placed in Howard Elmer Park. The time capsule was commissioned, filled and placed in the Sayre Public Library. A historical marker was placed at the Rest Cemetery on Bradford Street to honor those veterans buried there, some from as far back as the Revolutionary War, as well as to mark the location of the first school house in what would later become Sayre. The School Bell Memorial, housing the school bells from three former Sayre elementary schools, was built and placed in front of the H. Austin Snyder Elementary School on North Keystone Avenue. The Sayre Quarterly, the Society's magazine, continues to be published four times a year. THE BANDSTAND - THE SOCIETY SYMBOLThe Sayre Historical Society chose to display the bandstand in Howard Elmer Park as an iconic symbol of Sayre, Pennsylvania. 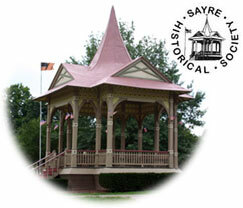 The present logo was created with the bandstand in Howard Elmer Park as a symbol of Sayre, Pennsylvania. THE CLEMENT C. HEVERLY AWARD In 1992, the Sayre Historical Society was the recipient of the first-awarded Clement C. Heverly Award from the Bradford County Historical Society of Towanda, Pennsylvania, for its dedication to preserving local history.